Voor reizigers die komen voor de bezienswaardigheden van Bangkok, is The Euro Grande Hotel een perfecte keuze. Vanaf hier kunnen gasten genieten van eenvoudige toegang tot alles wat de levendige stad te bieden heeft. Dankzij de praktische locatie liggen alle belangrijke trekpleisters in de buurt van het hotel. Profiteer van de ongeëvenaarde dienstverlening en voorzieningen in dit hotel in Bangkok. Dit hotel beschikt over vele faciliteiten die zelfs de meest veeleisende gasten zullen overtuigen. Aanvullend beschikken alle gastenkamers over een variëteit aan voorzieningen als kledingkast, handdoeken, plasma tv, spiegel, beddengoed, om zelfs de meest veeleisende gast te tevreden te stellen. Daarnaast garanderen de talrijke recreatieve mogelijkheden dat u zich tijdens uw verblijf kunt vermaken in het hotel. 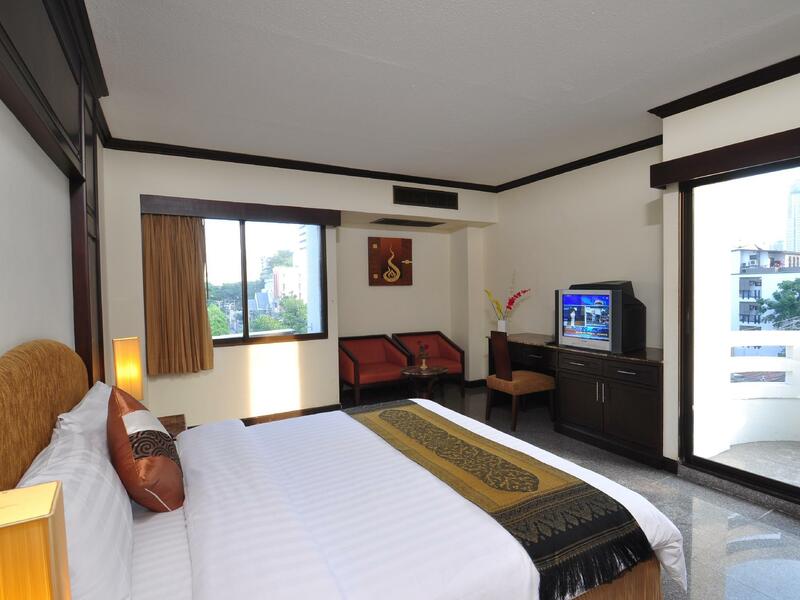 Het The Euro Grande Hotel is een ideale verblijfsplaats voor reizigers die charme, comfort en gemak zoeken in Bangkok. De accommodatie voorziet in een shuttle service naar nabij gelegen gebieden. Neem contact op met de accommodatie voor meer informatie. voordeel: redelijk ruime kamer, proper zwembad nadeel: toilet spoelde niet door, de airco was veel te luidruchtig, zwembad vlakbij de receptie en kon maar zwemmen tss 9u en 20u .... kortom goed voor 1 nacht, dan toch iets beter zoeken.prijs/kwaliteit ok maar kon beter. Het hotel ligt op 15 minuten lopen van BTS Asok(Sukhumvit). Grote kamer, ruime inloopdouche. Niet duur ook. Big clean and spacious room for a couple. You could fit a family of 4. Room & Facilities (A/C, Elevator, Bathroom and Toilet) were outdated, could do some renovation and upgrade. Breakfast was good. Front Desk was friendly and very helpful. Hotel offers tuktuk service to nearby BTS station, the hotel is around 1-1.2 km away from near BTS. Internet was fast but kept disconnecting couple of times. Overall stay was good. Would recommend this place. The male receptionist was very kind and spent time with me to figure out the best room that fit my description. The female receptionist not so approachable. I was very happy with my two-day stay even though some renovation noise is to be heard every now and then. Good Wifi, good Cable channels and a fair buffet breakfast. 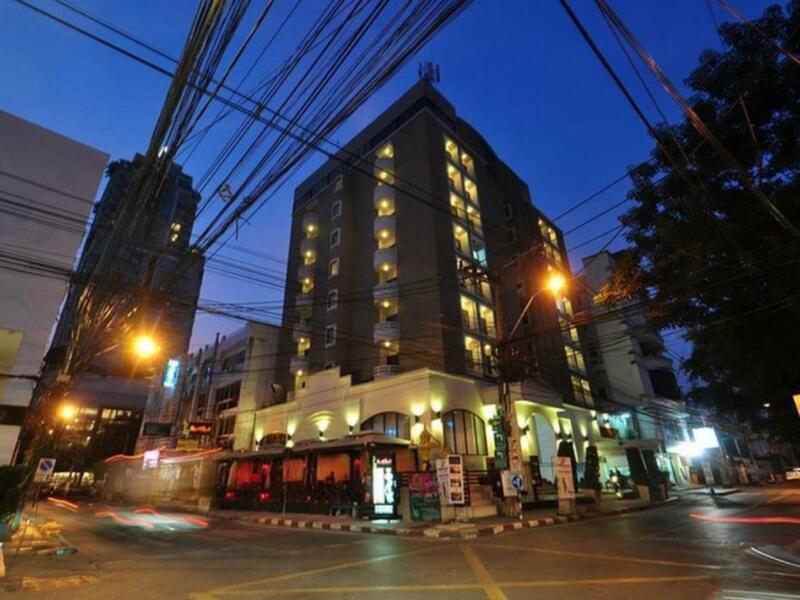 This hotel probably offers the best value near Sukhumvit. Luggage storage offered for free. They tried to make us take taxi with prepaid fare to the airport but we had been advised and it was 200 vs 500 they were wanting to charge us. That was the only major issue. Nice they have tuc tuc drop off for free but do get instrucions on how to return! got bathtub in the room, basic breakfast, noisy tap, germ in the bahtroom. The air con was very noisy, made it hard to sleep. The pool was nice but lots of mosquitos, which took a fancy to my legs. Breakfast was average but did the job. The best thing about this hotel is the staff, very helpful and very friendly. This is an advertisement of run down place. From soiled toilet seats to 30 year old TV. The wash basins are so old that they have tried painting it or something, and they are peeling off now. Stay only if you dont have any other options. Among the best one I booked in Thailand trip(4 hotels). Need to provide more toiletries and coffee/tea etc. 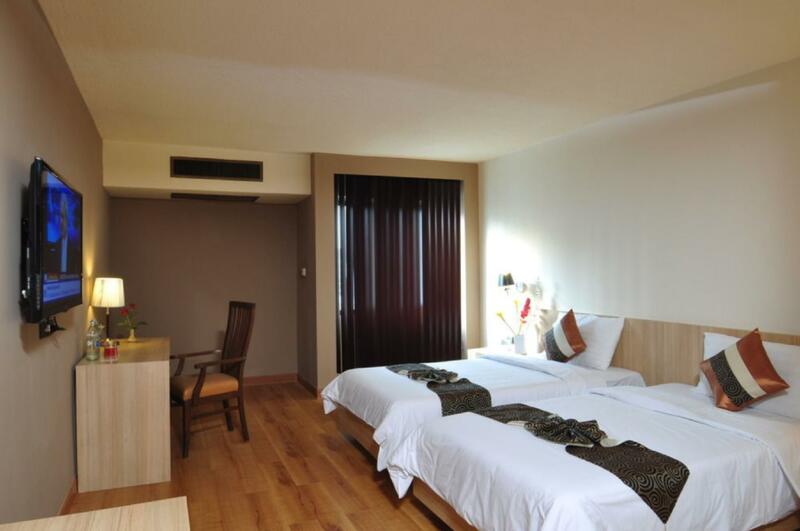 Else other things are just perfect and price is very affordable compare to expensive and dirty hotels in Bangkok. I will definitely come again if visit back to Bangkok. Thank you for your feedback, We hope you will have great experience in your next visit. Don’t ever go there, the room is unclean, staff doesn’t seem to understand anything, not worth your money !!! When arriving I was disappointed that the room was so old and worn down, and some of the features advertised on Agodo was not present, like no coffee, water boiler, and no sitting group. I asked the reception to change room and was shown a couple of options, but I decided to keep the room since it was very big and it had a new and big flat screen TV (the other options had an old style big bulky TV). Also, the staff in the reception provided a water boiler and told us that if we needed a place to sit when ordering food to the hotel we could use the hotel restaurant. The staff was very friendly and helpfull, but the room is very old. There are some coloring in the ceiling in the bathroom (mold?) and it's almost impossible to get a decent temperature in the shower - either it's very hot or very cold. The location is far away from BTS (about 15 minute walk), but the neighbourhood around the hotel is very nice with 7-eleven, bakery, several coffee shops and restaurants. Like most Bangkok hotels of it's age it's a little bit dated but is a good value for the money and the staff are really kind and helpful. The rooms are large. The area is great as it's quiet and away from the madness on Nana but you can still get there easily if you want. Would stay again. I've stayed at this hotel for 2 of my last 3 trips to Bangkok. I've experimented with hotels on Pattaya ... but if I'm travelling to Bangkok this is my only choice. Pros 1. The rooms were huge compared to other hotels in the segment 2.This hotel is very close to BTS ... just a 500 mt walk. 3.It has an attached restaurant as well as a hookah bar and Indian restaurant right next door 4.There is an ultra-posh mall right there, so many places to eat with different cuisines and an awesome massage parlor just a stone throws away. 4.The decor is rustic old school and it has a nice pool Cons 1.The decor is a little dated (that's the charm for me) though none of the rooms had any good views. 2.The AC was a bit odd to operate. 3.The joiner fee is ridiculous. My travel mate was charged 500B for each visitor while this was not informed upfront. Irrespective i still think it is ridiculous. Highly recommend this place if you are looking for a nice cozy place to stay. I had a nice 2 days at The Eurogrande, my room was old and worn but it was a nice,big space and everything worked; i was very comfortable. The were also extremely nice and helpful. The was nice and cool for the hot weather. Good value for for money. I will be back. Rooms are big but very old. Just book another hotel. If stay here you will regret. The staff (which is only one Philippines girl) is completely unhelpful to an extent to annoy you. If you need something, anything, they won't have it. The rooms have mosquitos. Another room air-conditioning is broken. The one that works was a very noisy ac. No room basics - no coffee pantry. Just an empty mini fridge. They room I stayed was clean. Thank God. The connecting restaurant is an Indian restaurant that has sheesha called Hooka. Their food is authentic and their staff are very friendly and charming.